Good evening, I hope you had a good start to your week. It has been a bright, clear day here with a little warmth in a sheltered spot, most welcome. 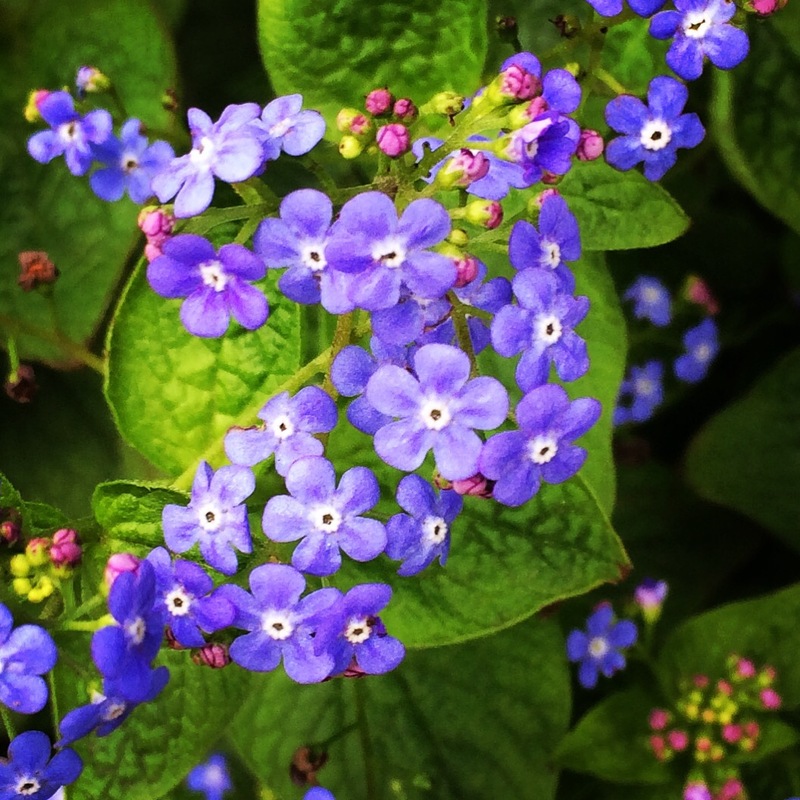 I wanted to share some of the many blue flowers about at the moment: Pulmonaria at the front, not really blue at all, they are more pink and mauve but they have a blue tone to them and so I am including them. Grape hyacinth, which some of you love to hate, I have no such strong feelings about them but just like to see their blue colour under the hedge. Cerinthe major purpurascens are self sown. It does seem early for them to be sharing their glaucus blue foliage and dark purple flowers but I am not complaining. I planted a dozen Hyacinth in my raised beds this autumn and this colour is sumptuous. 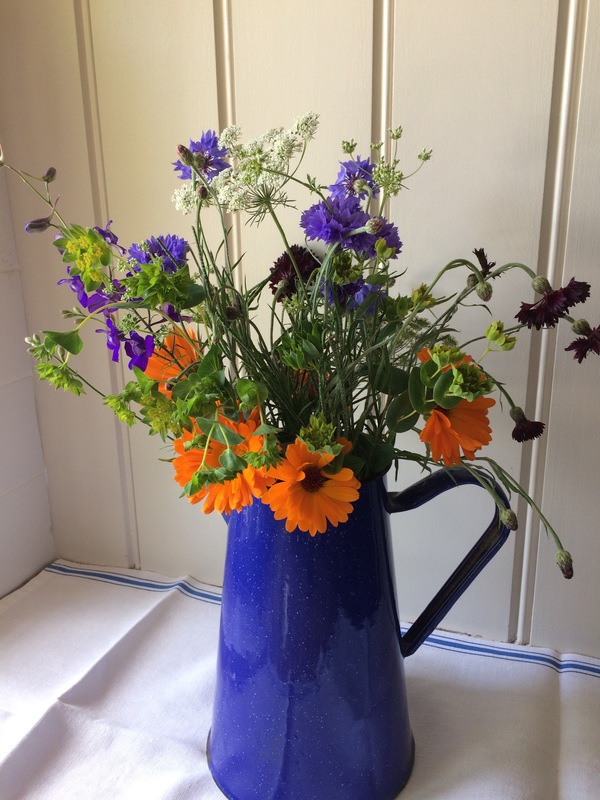 Cathy will be hosting our flowers gathered into vases, you should take a look and perhaps join us, it is lovely to have garden flowers at close quarters. Right time to go and prepare supper, have a good evening wherever you are. D.
Sarah Raven trade stand vases. Apologies to those of you who saw this as my Silent Sunday post. This is the last flowers from my bargain Amaryllis bulb I purchased before Christmas. 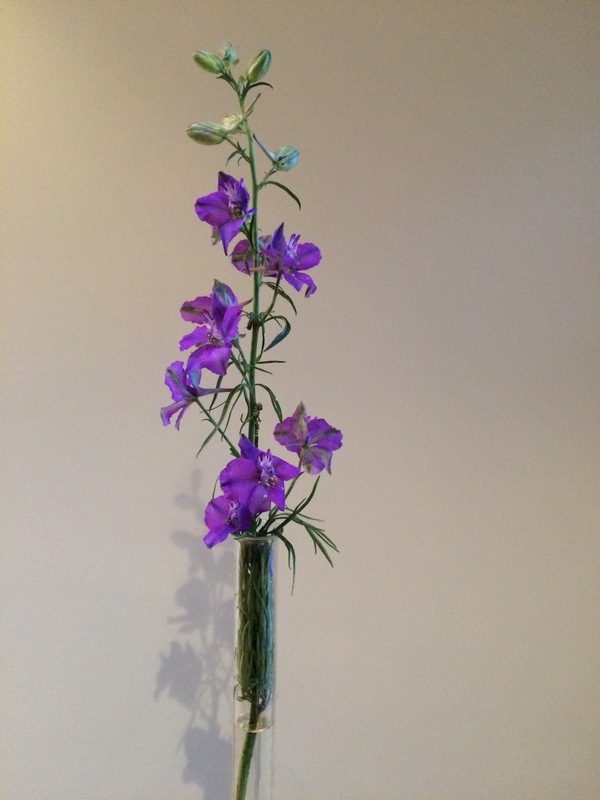 A cut stem as suggested by the in a Vase host Cathy. The blue glass bottle was a water bottle from a cafe in Cádiz last Summer. The fabric is a piece of hand woven linen, typical of the island of Mallorca. It was an off cut from kitchen cupboard curtains, no doors, in a place Brother in law Dorris used to live. A little blast of Summer. Have a good week and remember we are nearly half way through February which can only mean that Spring will really be on its way. 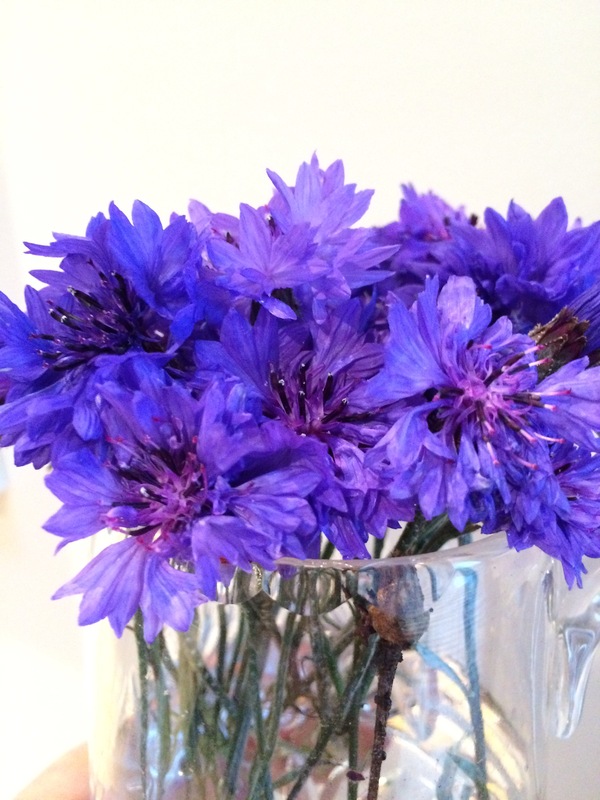 There is a friend out there (and you know who you are) who loves blue cornflowers. They were in her wedding bouquet I believe. I had been hoping to share these with her as the mild spell has generated a new bunch of flowers. 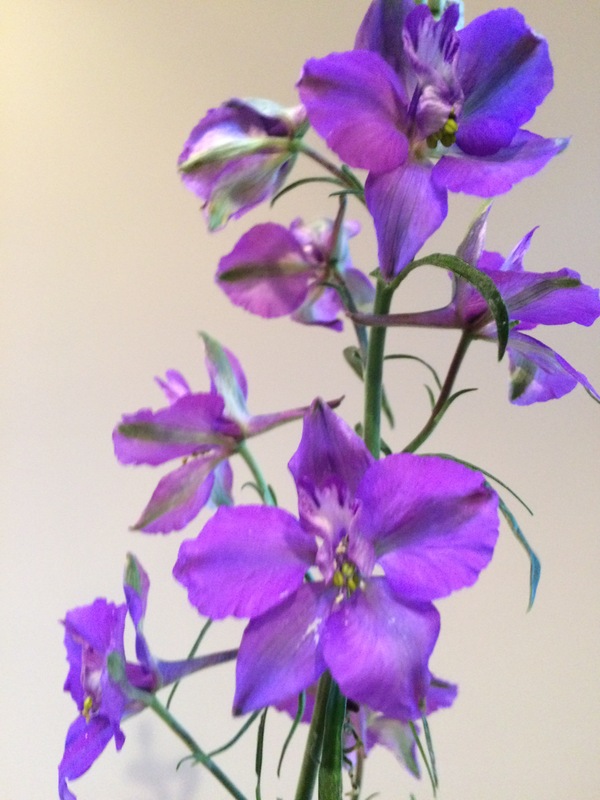 The Larkspur has also given me a bonus couple of new flowers. How lovely to see these in the house in mid October. I hope you enjoyed seeing them. 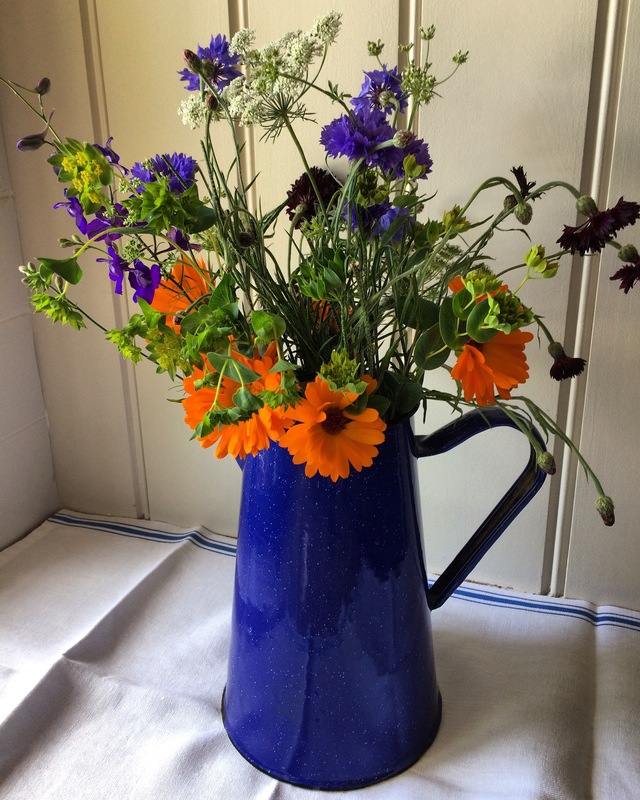 See what Cathy and the numerous in a Vase on Monday participants have shared with Cathy today. On Saturday I spotted a blue enamel jug for sale in Wendover. I did not need another vessel for flowers but the colour grabbed me and I gave it a home. 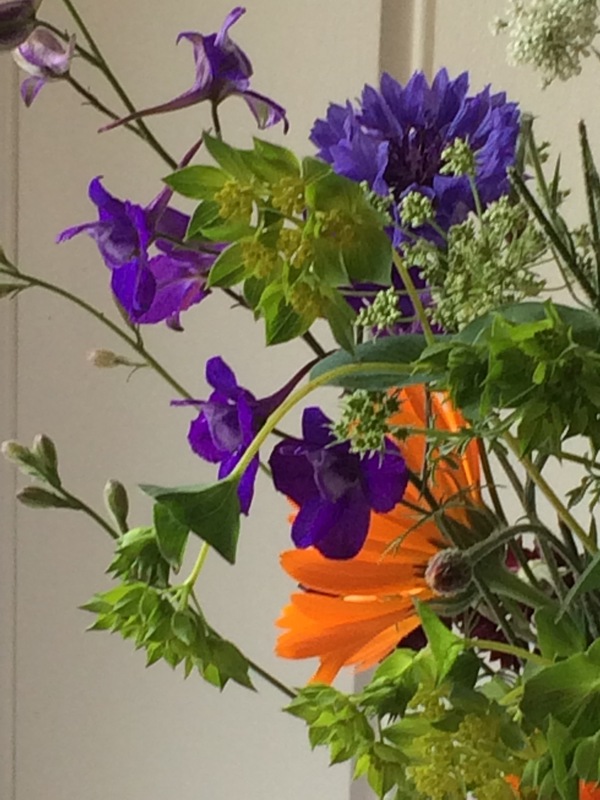 To set off such a strong colour I have picked blue Cornflowers of course, and a dark purple/blue Larkspur to match. Then, so that it is not too ‘matchy matchy’ I have added lime green Bupleurum rotundifolium and Calendula officinalis Neon. 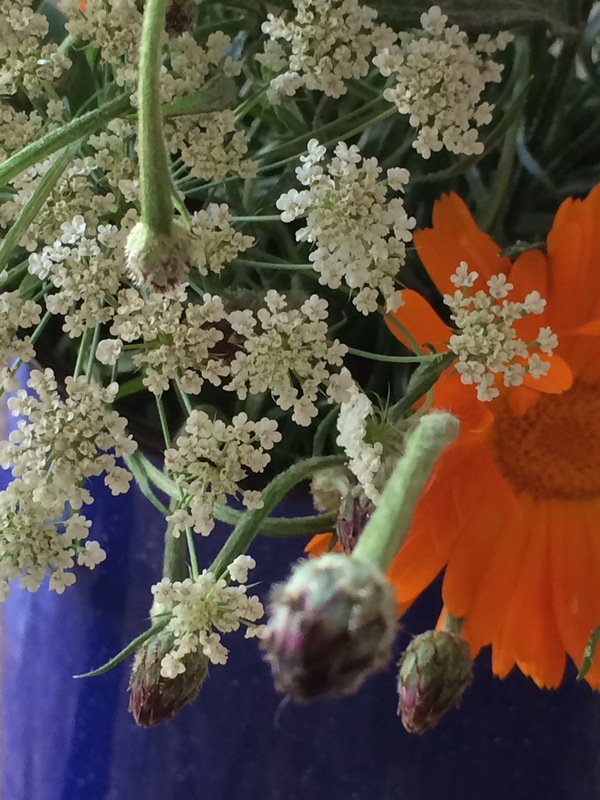 I could not leave out the pretty Ammi majus although to be honest it was not really fair to put her amongst the show off colours today. Cornflower Black Ball has done really well but it has been bashed to the ground by the heavy rain so I had to pick some of them too. 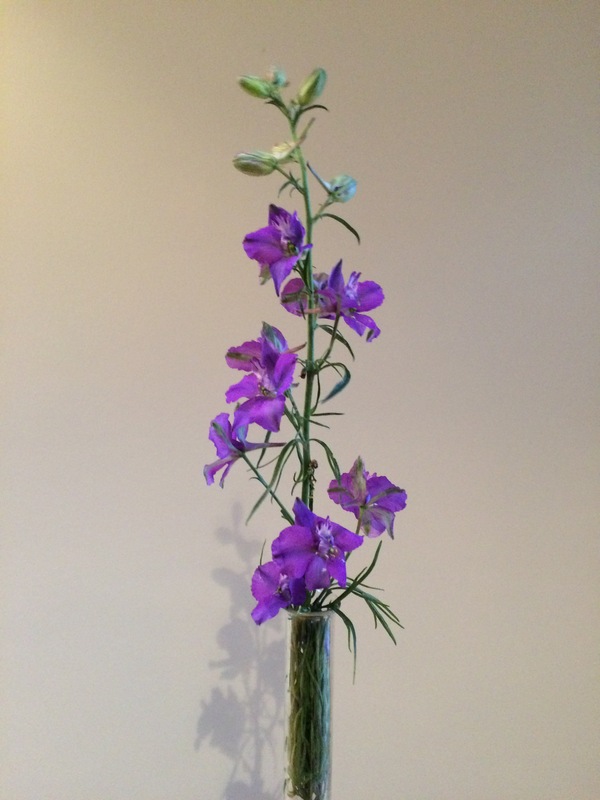 Cathy hosts the Monday vases and it is always wonderful to see what other contributors have found to display. Stop for a minute and take a look.